Polonium was discovered in 1898 by Marie and Pierre Curie, when it was extracted from the uranium ore pitchblende and identified solely by its strong radioactivity: it was the first element to be so discovered. Polonium was named after Marie Curie's homeland of Poland. 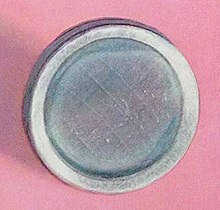 Polonium has few applications, and those are related to its radioactivity: heaters in space probes, antistatic devices, sources of neutrons and alpha particles, and poison. It is a radioactive element, and extremely dangerous to humans.